October 9 marked a major milestone in the history of Pixar Animation Studios as Finding Dory crossed $1 Billion in worldwide box office revenue, becoming the second film in Pixar history, along with Toy Story 3, to cross the threshold. Congratulations are in order to Andrew Stanton and the entire Pixar crew who put in countless hours to ensure they paid respect to the original story and characters of the beloved, Finding Nemo. Clearly, the hard work paid off as Dory and her aquatic crew have become the fifth animated film to gross over $1 Billion dollars in revenue — the list also includes Frozen, Minions, Zootopia and the aforementioned, Toy Story 3. 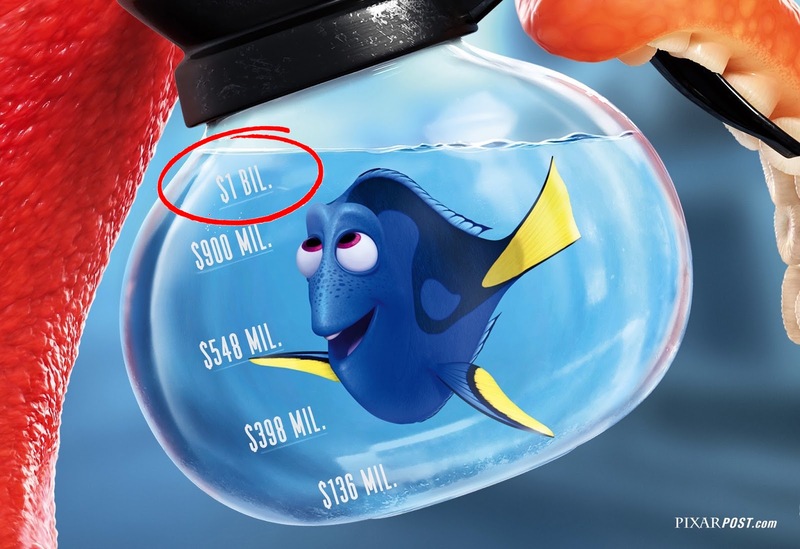 To put it into perspective how major this accomplishment is, Finding Dory is only the 27th film in history to cross over $1 Billion in box office totals. Domestically, the film has netted $484.7 Million to date, while the global marketplace has pulled in $516.7 Million (revenue via Box Office Mojo). Again, we can't congratulate the Pixar crew enough for the wonderful film they crafted and all the laughs and emotions they've allowed audience members to experience. Finding Dory has crossed $1 Billion in worldwide box office revenue - a big congratulations is in order for the entire Pixar crew.